Helena Holiday Flats0800 093 5071work Self-cateringClean, Comfortable 1 and 2 bedroomed apartments sleeping from 1 to 6 people. Refurbished Self Catering Accommodation with fully equipped kitchens, flat screen televisions with freeview and private shower rooms in all apartments. We are within a short stroll of The Spa, East Riding leisure, harbour, beach, town, bus and train stations. We do not charge our holiday guests extras for Gas, Electricity, Water, Bed linen or Parking Permits. There is a selection of games and books to keep you entertained. Also buckets & spades. All parties are given their own keys to ensure complete freedom to come and go as you please. You can arrive anytime after 2pm. All we ask is that you let us know if you are going to be arriving later. Clean, Comfortable 1 and 2 bedroomed apartments sleeping from 1 to 6 people. Refurbished Self Catering Accommodation with fully equipped kitchens, flat screen televisions with freeview and private shower rooms in all apartments. Credit/Debit card payment facility. We are located within a short stroll of the Spa Complex, East Riding leisure, town, beach harbour and public transport. centre Harbour, Beach, Town Centre, Supermarket, Coach and Train Stations. Children welcome from any age. Helena Holiday Flats offers weekly bookings starting on Saturday. Ground floor. 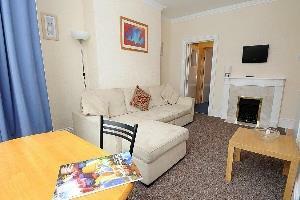 Has a double bed / sitting room, shower room and fully fitted & equipped kitchen. Flat 1a offers weekly bookings starting on Saturday. First floor. Has 2 bedrooms. 1st with a double bed and 2nd with bunk beds. Open plan kitchen/living room with a sofa bed. With a fully fitted & equipped kitchen and a shower room. Sleeps between 4 & 6 people. 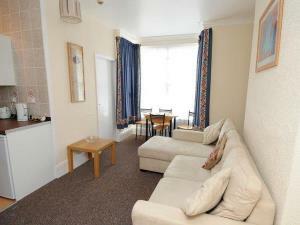 Flat 3 offers weekly bookings starting on Saturday. Second Floor. Has 1 bedroom with a double and a single bed. Open plan living room / Kitchen with a king size sofa bed. Sleeps 2 to 5 people. Flat 4 offers weekly bookings starting on Saturday. You can reach us by road from the south or west, just leave the M62 and follow the A614 to Bridlington, turn right at the first set of traffic lights when you enter Bridlington then straight on and right at the third set of traffic lights. The Yorkshire Coastliner runs a regular bus service from Leeds City Centre to Bridlington. The railway station is located a short walk from Windsor Crescent.